Cyprus’ extreme environmental stress may lead to early collapse! water resource problems (no natural reservoir catchments, seasonal disparity in rainfall, sea water intrusion to island’s largest aquifer, increased salination in the north); water pollution from sewage and industrial wastes; coastal degradation; loss of wildlife habitats from urbanization. Population density: It is estimated that at peak tourist season, the effective population density of [Southern] Cyprus exceeds that of the Netherlands (ranked world’s 25th most densely populated). After little winter rainfall, the drought in Cyprus is now in its fifth year. Cypriot water reserves are at their lowest for 100 years; however, the effective population of Cyprus (citizens and tourists) have multiplied by about 150 folds. “As long as the population remained [as] low [as] in the pre-industrial period, the water was sufficient for supplying cities which received water either from the mountains through the aqueducts or through the groundwater supply.” Said Chris Schabel, medieval historian at the University of Cyprus. The entire island including both the Turkish Cypriot north and the Greek Cypriot south divisions are drought stricken. The Island has an annual requirement of about 210 million cubic meters of water. As of July 16, 2008 the water reservoirs were only about 6.5 percent full. Down one percent in the last three weeks (33 percent of the level 12 months ago). Southern Cyprus’ 17 main reservoirs currently contain a paltry 17,733 cubic meters of water, some of which may be unsuitable for drinking. Emergency measures have limited the supply of running water to homes to only twice weekly. Most of the municipal wells have been shut down to avoid the risk of seawater contamination. Cyprus is buying from Greece 8 million cubic meters (2.1 billion gallons) of water to be delivered by November 2008 at a cost of €40 million (US$64 million). The water will only be distributed in the Greek Cypriot south. The first ship carrying water from Greece arrived June 30 at Limassol (Cyprus’ main port). The officials then realized they could not pump the water from tanker because their makeshift pipeline was 10 feet short. Because of the delay, the water turned “odorous” and was deemed unsafe for drinking. The entire tanker load of 40,000 cubic meters was subsequently pumped into the ground, instead of the city’s water network due to contamination fears! Under the initial agreement, two water-laden tankers were scheduled to leave Elefsina near Athens bound for Cyprus every day for six months (6 tankers delivering 200 shipments) between June and November 2008. The Turkish Cypriot north is negotiating a separate arrangement with Turkey for their water needs. The Greek Cypriot south plans to build a third desalination plant. “Extremely hot and dry weather conditions in Cyprus, combined with strong winds led to a disastrous upsurge of forest fires and wildfires in the Troodos Montain area on 29 June 2007. … Small villages had to be evacuated. Some houses were destroyed. Cyprus reported severe material damages in the area. Moreover, two forest fires hit Cyprus on 16 July 2007 in touristic areas of the Island. The first hit the vicinity of the Kalavasos village area … The other was close to Kornos village, which is located 20 km south of Nicosia [capital city]. The total burnt area … in Cyprus measured from satellite imagery on 31 July 2007 was 12 286 hectares.” European Civil Protection. Climate change is pointing at us “like a loaded gun,” warned the EU Agriculture Commissioner Mariann Fischer Boel at a conference on water policy last week. 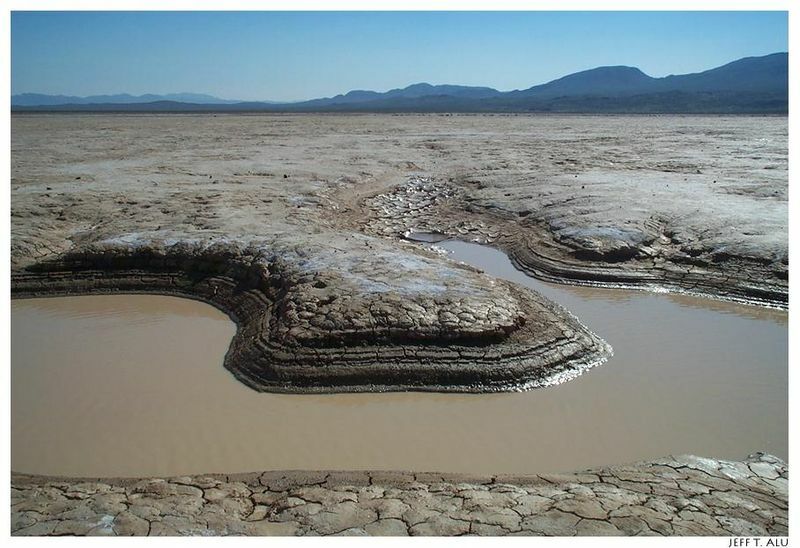 “We are going through a visual process of desertification. Krasochorio near Limassol, has lost its environment [Ecosystems have collapsed]. Around 85 per cent of the population has left. In Lania, 30 villas are surrounded by burnt land after the fires. What can the villagers do with them now?” Said the former Cypriot Agriculture Ministry official, Antonis Constantinou. Cyprus is situated in the eastern Mediterranean south of Turkey, north of Egypt, and east-southeast of Greece, It is the third-largest Mediterranean island and a busy tourist destination, attracting about 3 million tourists each year. A former British colony, it gained independence from the UK in 1960 claiming sovereignty over 97% of the island and surrounding waters, with the United Kingdom controlling the remaining three percent. It became a member of the European Union May 1, 2004. 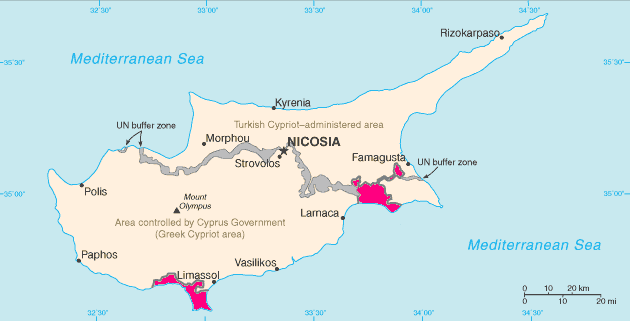 Map of Cyprus: WSBA and ESBA (British military bases at Akrotiri and Dhekelia) are in pink, UN buffer zone dividing the northern (Turkish) and southern (Greek) administrations is shown in gray. The map is adapted from the CIA World Factbook map. (Source).